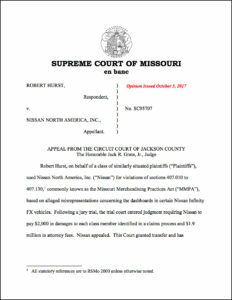 The Missouri Supreme Court, in an opinion dated October 5, 2017, overturned a judgment against Nissan North America, Inc. totaling over $2 million. A group of plaintiffs were certified for a class action lawsuit against Nissan, alleging damages under the Missouri Merchandising Practices Act (MMPA) for dashboards that were prone to bubbling in heat or humidity. 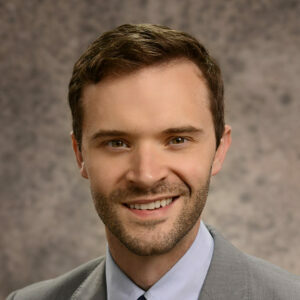 The case turned on whether Nissan’s advertisements that the vehicles were “luxury” or “premium” vehicles were a fraudulent misrepresentation actionable under the MMPA due to a defective component part or whether they were just puffery, as in opinions that cannot be easily refuted or proven. While such statements are not actionable under common law, the Court ultimately took a pass on whether puffery is actionable under the MMPA. Giving the plaintiffs the benefit of the doubt and assuming that the words “premium” and “luxury” could be factual statements, the Court still found a lack of evidence that these statements were false and entered judgment for Nissan, overturning the massive $2.5 million verdict. Here’s why it matters: The Court had an opportunity to make a distinction between statements that are fraudulent, and statements that are mere puffery under the MMPA. If statements such as “premium” and “luxury” are going to be considered factual for purposes of determining fraudulent misrepresentation under the MMPA, it could lead to a carousel of cases taking a ride into Missouri courts under the MMPA. Additionally, the facts of this case are particularly troubling and highlight the need for reform under the MMPA. The class at the center of this case included “many members whose dashboards already had been replaced by Nissan without cost and many other members whose original dashboards never ‘bubbled.’” The trial court determined there were 326 members of the class: 119 of those members had already received a free replacement from Nissan and there was no evidence that any of the remaining members even had a problem with their dashboards. Despite the problems with the class, a judgment was entered awarding $2000 to each member for a total of $652,000 in damages and a staggering $1.9 million in attorney’s fees. Despite the verdict being overturned by the Missouri Supreme Court, Hurst v. Nissan highlights the abuse the business community is subject to under the current MMPA and its interpretation by judges. The MMPA was set up to protect consumers from misleading or fraudulent misrepresentations when they sustained actual damages. 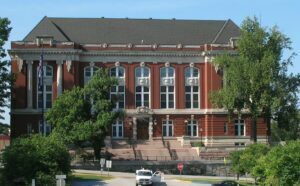 It was not created as a get-rich scheme for lawyers on the backs of Missouri’s employers. The MMPA should protect consumers by considering objective measures to determine their actual damages and rein in attorney’s fees that bear no reasonable relationship to the amount of actual damages suffered.